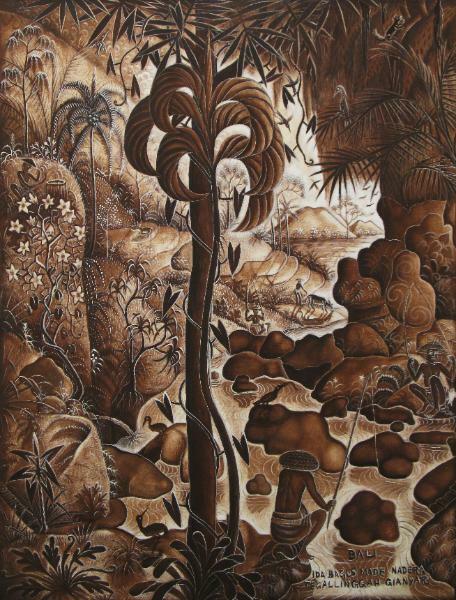 Ida Bagus Made Nadera is one of Bali’s great painters. His paintings are characteristically busy but meticulously organised and multi-layered. They have a quality that is both expressive and surreal and frequently include magical dream-like themes that draw on Balinese mysticism. Typically they revolve around the Balinese belief of the interconnectedness of work, play, spirituality and dreams. Nadera was born in Tegallinggah, Bedahulu village in Blahbatuh in the regency of Gianyar. He was presented with both the Wija Kusuma and the Dharma Kusuma art awards. He joined the Pita Maha painter’s association in 1936 which was founded by the famous émigrés European artists Walter Spies and Rudolf Bonnet. Nadera’s personal life was tumultuous. He married four times and had at least nine children. topeng (mask) dance, and was expert in reading ancient palm leaf manuscripts in Kawi, a now extinct written and spoken language of early Bali and Java. Several of Nadera’s works are on display in the Neka Museum, Bali and the Presidential Palace in Jakarta, and his in recent years his works have been included in auctions held by major international auction houses such as Christie’s and Bonhams.